Indeed Labs Just Launched the Hydraluron Intense Moisture Lotion...and It's Fantastic! 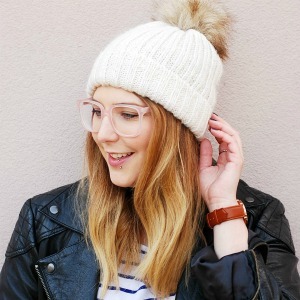 Leather jacket season is still in full swing, but the latest launch from Indeed Labs is already at the top of my summer skincare favourites list. And despite the fact that there are about a million different lightweight moisturizers on my dressing table waiting to be thoroughly tested, I’m confident that it will stay there. 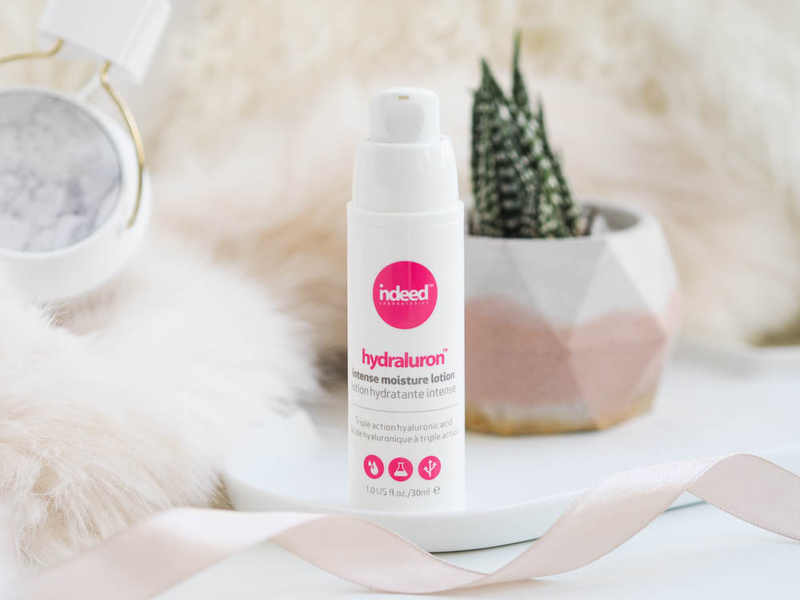 Even with all the shiny new summer launches currently demanding my attention, I only have eyes for the Hydraluron Intense Moisture Lotion. It ticks all the boxes — affordable, easy to find in drugstores, travel-friendly, and perfect for sensitive and allergic skin. 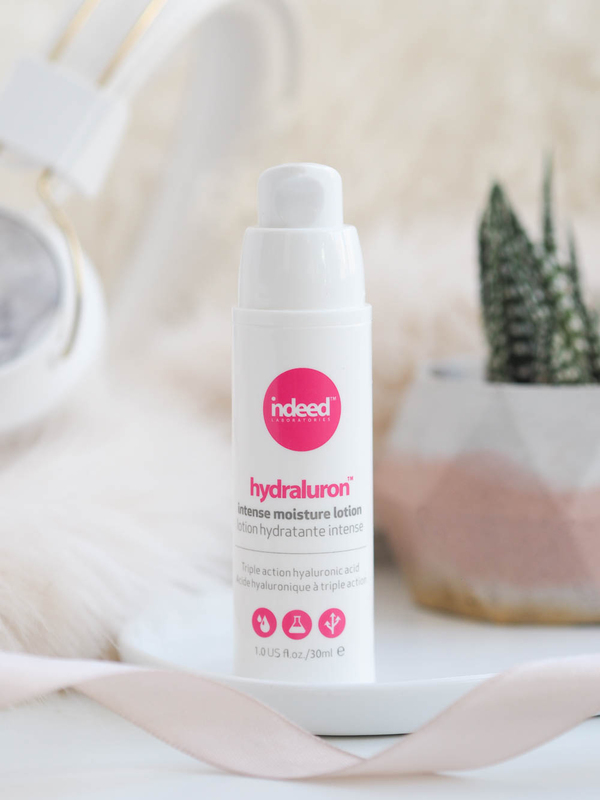 The Indeed Labs Hydraluron Intense Moisture Lotion* ($22.99) is the third product in the Canadian brand’s popular Hydraluron range, along with the Hydraluron Moisture Serum and the Hydraluron Moisture Jelly. 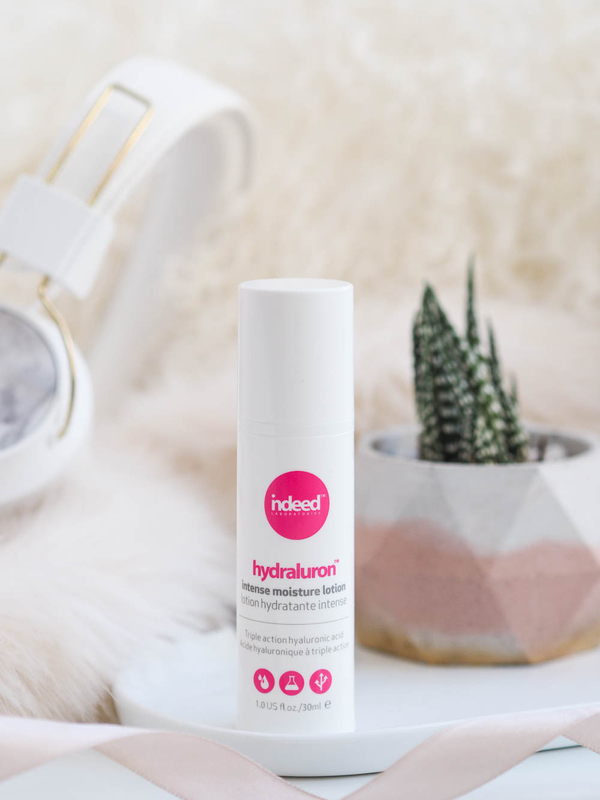 British skincare goddess Caroline Hirons has been raving about the Hydraluron Moisture Serum for years, and the Intense Moisture Lotion comes with her seal of approval too, so you know it’s good! The Indeed Labs Hydraluron Intense Moisture Lotion offers both hydration and protection against environmental damage. The lotion is packed with high, medium and low molecular weight hyaluronic acid, the superstar ingredient that Indeed Labs is most known for. When it comes to hyaluronic acid, size does matter, and having a good mix is essential — a smaller molecular weight penetrates deeper into the skin to plump and hydrate, while a larger weight sits on top of the skin to form a protective barrier and attract even more moisture. Hyaluronic acid is the ideal ingredient to add to your summer routine as it helps heal and soothe sunburned skin. QUICK FACT: hyaluronic acid holds up to 1,000 times its weight in water. It’s hydrating AF! The Hydraluron Intense Moisture Lotion is also formulated with squalene, a plant-derived emollient and antioxidant. This baby works miracles on dry patches! I’ve been hearing about this ingredient a lot recently, so it’s definitely about to make it big onto the drugstore beauty scene. There’s also Sepitonic M3, which I honestly don’t know much about. According to Indeed Labs, it’s a ‘powerful multi-mineral energizer that includes copper, magnesium and zinc’, which helps increase circulation, oxygen levels and protect the skin from free radical. I love the Hydraluron Intense Moisture Lotion because it’s affordable and simple, without compromising on the experience or the results. The fragrance-free lotion is light as air and absorbs like a charm, but it has a richness to it that soothes dry skin instantly and works both for day or night. I’ve had flaky, red and irritated skin that just won’t heal for months around my eye area, so I’ve had to adjust my skincare routine over and over again to find products that won’t burn upon application, but this has worked so well for me. It doesn’t sting or burn, and the lotion feels silky smooth, so it’s a real treat after a long day. It plays well with the Hydraluron Moisture Serum (of course!) and the Indeed Labs boosters, and it works well as a base under makeup. There’s no greasy feel at all, and I love that I can just get on with my makeup right after application. The packaging also deserves a prize. The Indeed Labs branding is on point, as always, and the 30ml pump format is hygienic and travel-friendly. It’s perfect to throw in a handbag for long days at the office or in a carry-on for weekend escapes. You don’t get a ton of product, so it has to be repurchased fairly frequently, but it still works out cheaper than most moisturizers I own, including the LANEIGE Water Bank moisturizer I recently finished. This is another outstanding skincare product from my Indeed Labs fam. I trust Indeed Labs because they care for sensitive, allergic and dehydrated skin really, really well — and because Caroline Hirons loves them! 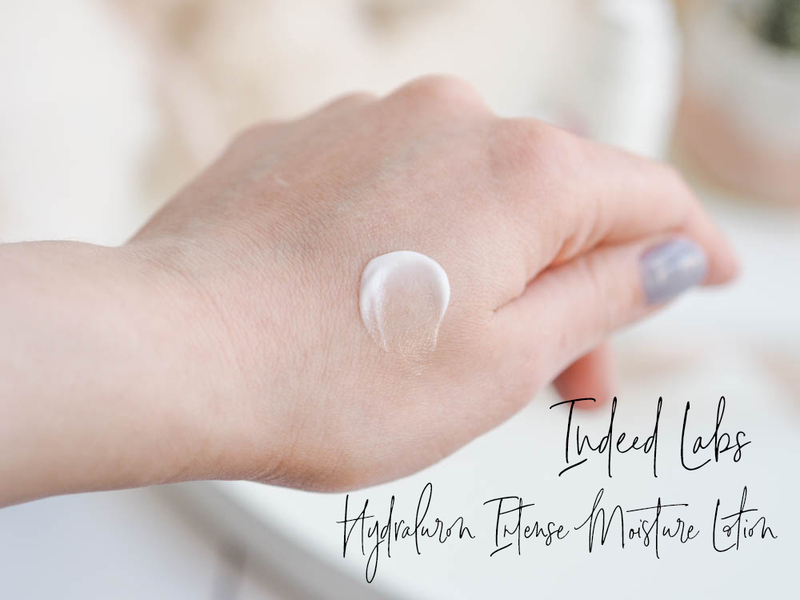 I was disappointed by the Hydraluron Moisture Jelly when it first launched (it didn’t do anything for my skin, aside from feeling tacky), but the Hydraluron Intense Moisture Lotion is everything I wanted an Indeed Labs moisturizer to be. It’s light and rich all at once, hydrating, completely fragrance-free, and it feels nice to use. Plus, it’s a real Canadian success story! I had the pleasure of meeting Caroline Hirons at the Indeed Labs Hydraluron Intense Moisture Lotion media launch in Toronto, and she was kind enough to sit down with me and create a personalized skincare routine out of the Indeed Labs products best suited for sensitive and allergic skin. Keep an eye out for that lovely story!